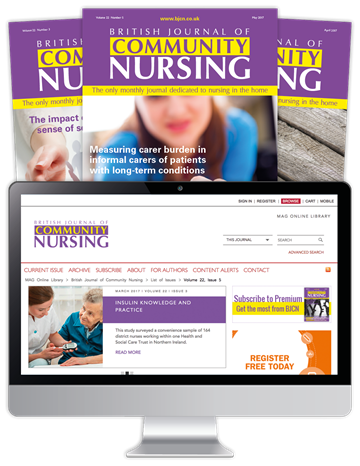 British Journal of Community Nursing is the UK’s leading peer-reviewed journal for district and community nurses, containing the most up-to-date clinical coverage primary care research. Providing important information on all relevant clinical topics including palliative care and long term conditions, it helps readers to manage complex cases more effectively, inform their practice and professional development, and gain a greater understanding of the modern NHS system. such as care of the older person, psychology, and long-term conditions. and meet your CPD requirements. person-centred care to your patients. Save 10% when you subscribe today, and receive the journal and your free gift from just £2.38 per week. To claim this offer, please select your appropriate subscription option below, and quote coupon code BJC18C when prompted at the checkout.